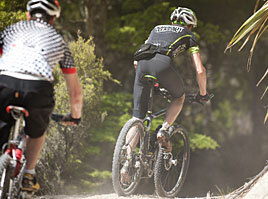 TORATORA Mountain Biking Trails feature over 20km of exhilarating purpose built XC trails, designed and built by one of New Zealand’s most respected mountain bike trail builders. “TORATORA is a unique Mountain Biking experience that will appeal to the broad spectrum of mountain bikers, while appealing to the expert riders too. Continuing to expand the network in the same vein as what is already established, TORATORA will become a great mountain biking destination” SPOKE magazine, July 2011″. Exhilarating MTB trails snake through 375 acres of spectacular native bush, via meandering creeks and breathtaking ridge-tops that dominate the skyline above the Tora Coastline. Trails are littered with beautifully sculpted berms, rollers, tabletops, long flowing descents, switchbacks, rider friendly hill-climbs and exhilarating down-hills. With a professionally built 16km Native bush XC track, more than 2km of optional hand-built technical trails through Native Bush and a 6km beginners track, TORATORA has something for everyone. From the former far west boundary of the historic 13,500 acre Tora Station to the shores of the Pacific Ocean, TORATORA encompasses the truly magnificent, dynamic and diverse environment of the coastal Tora Region. At TORATORA you can either discover the trails as a day-tripper or combine Mountain biking with the well- appointed historic accommodation. The result – a unique and exciting mountain biking adventure. TORATORA has been created to meet the needs of social, family, sports, educational and corporate groups. Create a package to suit your needs.